California prison suicides: federal expert quits in frustration, says state corrections officials ignore his recommendations. 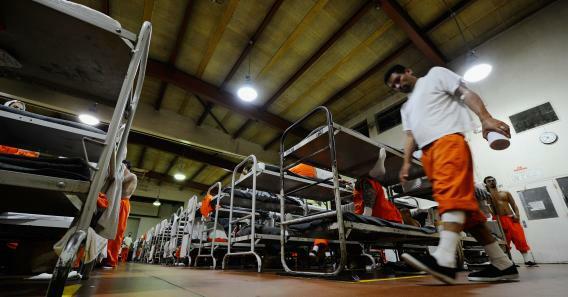 An inmate at Chino State Prison, which houses 5,500 inmates, walks past the double and triple bunk beds in a gymnasium that was modified to house 213 prisoners in Chino, Calif.
How bad is the suicide crisis in California state prisons? Well, the expert hired by a federal court to help end it is quitting out of frustration, calling any future attempts on his part a “further waste of time and effort.” To be clear: It’s not that he thinks it’s a problem that can’t be solved, just that state prison officials aren’t interested in finding a solution. But the real issue seems to be that prison officials, along with Gov. Jerry Brown, don’t want federal oversight on the issue at all. The statement continues: “CDCR is identifying and implementing improvements on its own. We do not need further intrusive and costly federal court oversight.” In fact, U.S. District Judge Lawrence Karlton is set to rule later this month on the state’s bid to end federal oversight of mental health treatment in the prison system. We’re guessing this latest development won’t exactly be a boon to the state’s case. For more on the mental health and overcrowding issues plaguing the state system, Southern California Public Radio has a piece with some good context.